Eltronicschool. 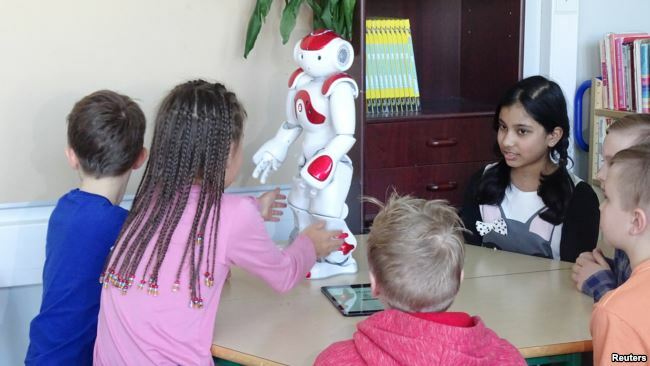 - This is one of the information for you you who want to know the robot educator in this time with the article here titled with Techno Teachers: Finnish School Tests Robot Educators that published in Reuters online. Elias, the new language teacher at a Finnish primary school, has endless patience for repetition, never makes a pupil feel embarrassed for asking a question, and can even do the "Gangnam Style" dance. The robot is able to understand and speak 23 languages and is equipped with software that allows it to understand students' requirements and helps it to encourage learning. In this trial, however, it communicates in English, Finnish and German only. "I think in the new curriculum, the main idea is to get the kids involved and get them motivated and make them active. I see Elias as one of the tools to get different kinds of practice and different kinds of activities into the classroom," language teacher Riika Kolunsarka told Reuters. "In that sense, I think robots and coding the robots and working with them is definitely something that is according to the new curriculum and something that we teachers need to be open-minded about." And now you can read more about the article of Techno Teachers: Finnish School Tests Robot Educators by Reuters from original source using the link HERE.